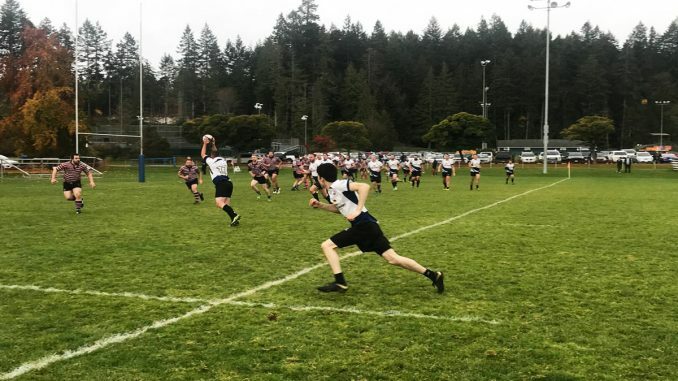 From unlikely beginnings, the Prince Rupert rugby program has found two more diamonds in the rough in Jason Rioux and Dionte Stephens. The two athletes were scouted last fall by the Thunder Rugby program, a program that places importance on Indigenous athletes. John Lyall works as an athletic director of the Thunder program, and he stresses the importance of recruiting First Nations athletes across the country. Coach of the Thunder, Clayton Panga, made the trip from one island to another as he came from Victoria to Prince Rupert last fall. He was immediately impressed with what he saw in both Stephens and Rioux. Very evasive and fast and just a very exciting all-around athlete,” Panga said when asked about Stephens. While both athletes may be naturally gifted at the sport, neither of them saw rugby as their speciality. Stephens was a track and basketball player, while Rioux wasn’t a fan of team sports. Speedy Jason Rioux aims for family greatness “Figured I was a solo sports kind of person, and I saw one game of high school rugby and I was hooked,” Rioux said. “I wish I was as good at basketball as I am at rugby naturally,” joked Stephens. Stephens, in particular, didn’t have his sights set on rugby, but because of a post on social media, he decided to head to down to the field. Panga has a keen eye for spotting talented rugby players, and he has been playing since he was four. He was born and raised in New Zealand and said that rugby there is equivalent to hockey here, and New Zealand’s Maori All Blacks national team are made up entirely of members of their Indigenous community. “We are trying to build the connection between the rugby community and the Indigenous community. We want to engage those athletes with rugby, and show them there is a pathway,” Panga said. Both Rioux and Stephens also recognize the importance of showcasing our Indigenous athletes at all levels. “It’s important. I take pride in being able to be a part of these things. It gives First Nations athletes the opportunity to be seen at a higher level,” Rioux said.